By Peter Mueller, Marcel Fiocchi, FioTec (Thailand) Co., Ltd. Rising solvent prices and an increasing awareness for environmental protection measures make solvent recovery processes not only a ecological but also a very interesting economical solution in many coating businesses, such as magnetic tape or adhesive tape as well as the printing industry and many others. Thailand and other south east Asian Nations still have solvent prices that are much lower than world average, but this situation might drastically change during the next 5 to 10 years. It might be interesting for many coating industries to look after solutions to reduce solvent usage and energy consumption. One option to consider is solvent recovery through inert gas direct condensation - with this option more than 99% of the solvent entering the dryers will be recovered and energy (heating energy) will be saved compared with a conventional dryer system or even water based coating. (Much more energy required for drying process). When using solvent mixtures, the solvents recovered by condensation present a composition that usually makes possible a direct re-use of the solvents, due to the fact that the recovered solvents are exactly of the same composition as the solvent mixture which entered the dryers. The condensation process for solvent recovery requires a drying as well as a heating system that completely excludes gas losses to the exterior or the entry of ambient air into the system. This requirement can only be met by using a new dryer and air system as the smallest leakage at flanges, connections and covers results in an unacceptable high gas intermixture. Furthermore, the design of the web entry and exit section of the dryer is of extreme importance. A specially constructed gas sealing system with a precise pressure control system will therefore have to be used. This construction enables continuous operation at smallest inert gas losses and ensures an economical operation. An efficient drying process is another very important basic requirement for the operation of an inert gas solvent recovery installation. The ideal dryer for inert gas operation has extremely high heat transfer values; this enables a drying process at low gas temperatures and keeps the necessary cooling capacity of the recovery installation within acceptable limits. The drying process according to the airfoil principle is specially suited for this use. The above declarations show that only dryers that are specially designed for this application will fulfill the requirements. This recovery method is suited best for the solvent drying of coated webs; drying processes of sheet coatings or even of bodies of three-dimensional extent however, are not easy to solve due to sealing problems at the dryer entry and exit. It is difficult to determine the limit of profitability with respect to the minimum solvent quantity, as the price for the solvent, as well as the annual production hours play an important part. Today, the limit of profitability for cheaper solvents such as methanol, gasoline and toluene ranges between 70 - 150 kg/h; the limit for more expensive solvents can be as low as 20 - 80 kg/h. (E.g. for THF). An upper limit is non-existent. Installations with capacities between 2000 - 3000 kg/h have been constructed with the existing technique. High safety is another very important point. As long as the content of oxygen in an inert gas dryer is below 13%, combustion or an explosion cannot take place even at extremely high solvent concentrations due to the lack of oxygen. Therefore, a possible fire on the outside of the dryer cannot propagate to the inside. This danger however, can never be excluded when working with a normal air dryer (even with one that is equipped with the best safety technique), as theoretically there always exists a flammable mixture just above the running web. When working with inert gas (air with an oxygen content of 2 - 4% max. ), the safety range to the critical values (an oxygen content of more than 13%) is sufficient from the point of view of safety specifications. Certain solvent based coatings extract unwanted components during the drying process; some lacquer binders for example extract organic matters (phenols, formaldehyde, cresols etc.). The drying temperature highly influences the gaseous extraction of these substances. As the drying temperatures are relatively low when working with inert gas condensation, theses substances are less extracted than with working with conventional dryers. The insignificant quantities of high-boiling particles that evaporate despite the low gas temperatures are generally insignificant if the proper operating conditions of the system are selected. In principle, the first decision about the type of process can be made according to the above criteria. 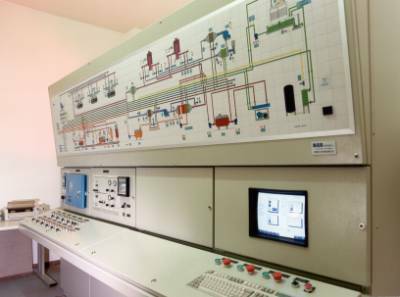 Based on numerous parameters with respect to the applicability of the technically matured solvent recovery systems, only a detailed study may give the decisive factor for the one or the other system. According to the drying technology, a certain gas volume is circulated in the gas-tight dryer. A certain gas quantity is sucked off the circuit and is led to the recovery installation where it is cooled down below the dew point of the carrier gas and the solvent vapor mixture. A certain solvent quantity is now separated by condensation. Afterwards, the carrier gas containing much less solvent vapor is heated up again in a Recuperator and the now relatively dry and hot gas is led back to the circuit. The installation is controlled and checked by safety system specially designed for this use. The generally redundant safety system technique ensures safe operation even at a failure or a defect on a measuring element. The oxygen content has to be supervised at several points of the system by a modern process controller. A very sensitive pressure control system monitors the pressure in the inside of the dryer and in the sealing zones. Automatic damper control systems are used for the control of different gas flows within the dryer and the solvent recovery systems. The installation is mechanically locked so that an erroneous opening of the dryers during the inert gas operation or a starting of the system when the dryers are not completely closed will not be possible. All the process data is constantly monitored and fully recorded. 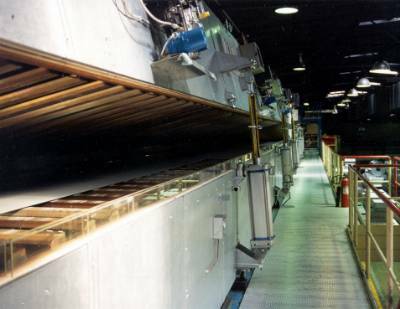 Due to the full automation of the system, not more personnel are required than with a conventional coating line with air dryers. This new conception stood the test with respect to efficient production and corresponds to the highest demands concerning working safety, environmental protection standards, low working expenses and easy handling. 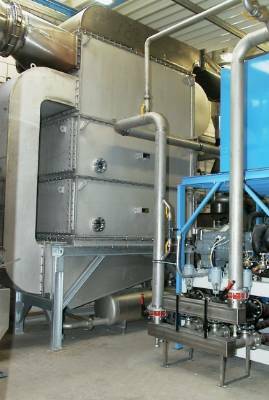 FioTec (Thailand) Co., Ltd. has extensive experience in evaluating, engineering and erection of turn-key systems in Europe, USA and Asia by setting up various systems for solvent recovery (direct condensation plants, adsorption-desorption plants) and air pollution control (thermal after burner, thermal reactors). In Thailand and all other developing Nations, FioTec (Thailand) Co., Ltd. can offer up to 100% financing with very interesting and competitive terms for all projects that benefit the environment (such as solvent recovery systems and exhaust air cleaning systems) through our financing partner. Please contact FioTec (Thailand) Co., Ltd. here for further information.